I’ve been online quite a bit lately. And whenever I get a free minute, I start browsing the websites I’ve discovered since starting my blog. One link leads to another, which leads to a new bookmark, a new image, or a new discovery. By the time ten minutes have passed, I’ve got seven tabs open on my browser, four new bookmarks, and no idea what I was looking at in the first place. Similarly, picking your primary colors for a room can be just as tricky and meandering a task. There are SO MANY great colors, shades, hues and tones to choose from, and it’s hard to know where to start. 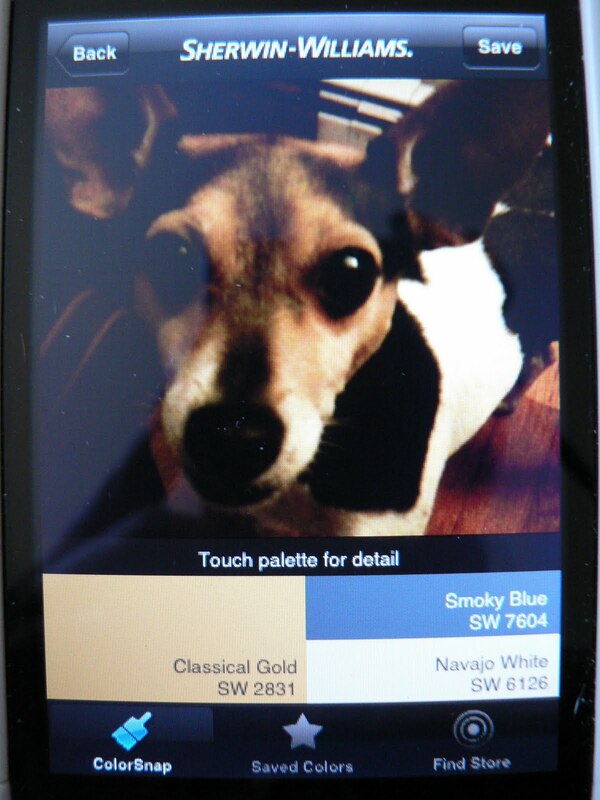 That’s why I love the iPhone apps created by paint companies Sherwin-Williams and Benjamin Moore. They’re like writer’s block erasers, in visual (and virtual) form. Both apps work on the same principle. You snap a photo or select one from your photo library, and the program conducts a color match based on the area of the screen you touch. You can then save the corresponding paint chip number, so you have it on hand when you visit the retail location kindly selected through your phone’s GPS. The programs also differ in subtle ways. I’ve taken some amateur photos using Roscoe, my very patient rat terrier, to illustrate the point. Color Snap is useful when you seek a precise match. Using a little text box, you can clearly zero-in on a specific section of your image. 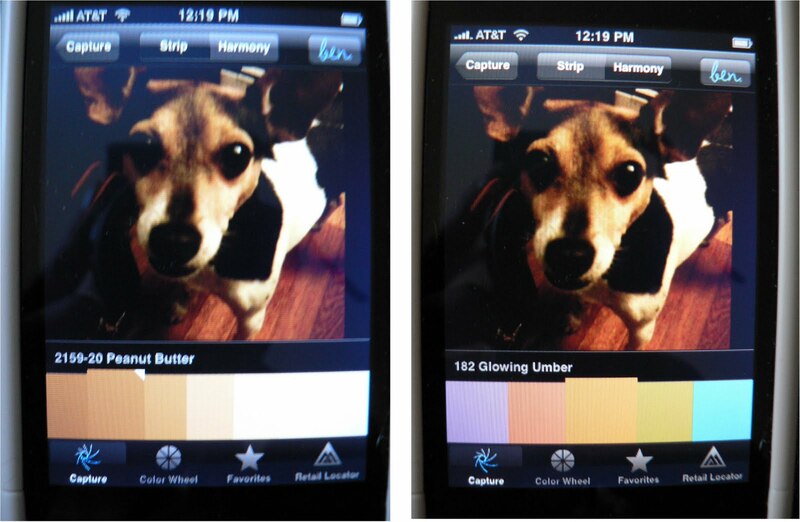 In addition to the color recommendation, Color Snap also offers creative suggestions for secondary colors. Benjamin Moore is better when you want more options. If you’re set on a color but not the intensity, you can view the shades featured ‘higher’ and ‘lower’ on the virtual paint chip. It also works by touch, but it’s a little more hit-or-miss based on how accurate your finger is at touching. The complementary shades are also less prescriptive here. The best thing? They’re both free, and they’re both a helluva lot of fun. If you don’t have an iPhone, don’t fret (I’m a very recent convert). 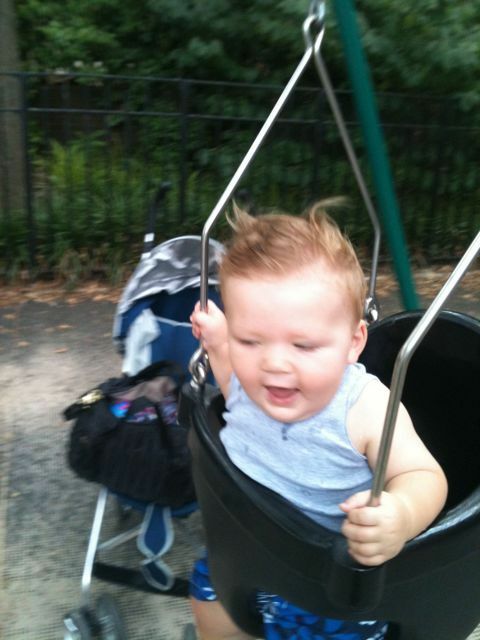 Both websites also have great color visualizing tools online for uploading pictures and playing around. 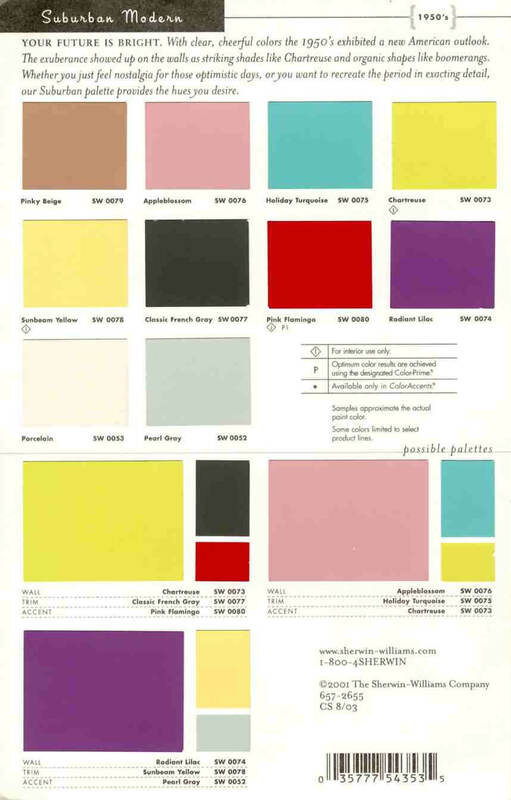 If you seek more color chip inspiration and you’re a mid-century fan, I strongly recommend Retro Renovation. It’s a fascinating site. Rather than focusing on the exclusive and high-priced items we associate with that period, it celebrates all the middle-of-the-road design (think tract houses and pink-tiled bathrooms) that most Baby Boomers grew up with. (Mad Men fans, think Draper residence, not Campbell apartment). But after nearly a decade of living in un-renovated New York apartments, I think I’ll wait a while before returning to “Appleblossom pink” featured on the chart at top.